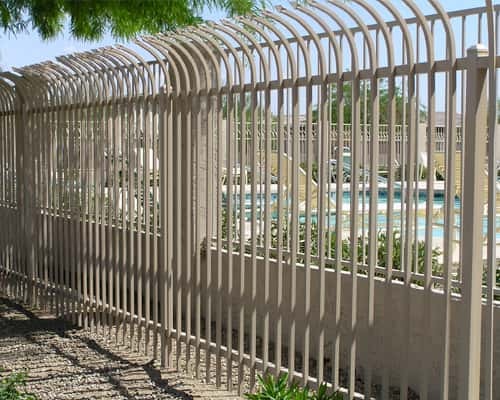 Sun King Fencing & Gates manufactures and installs decorative wrought iron fencing across the Phoenix area. Call 602-989-0839 to discuss your fencing needs. Add a touch of class as well as security to your home or business. Decorative wrought iron fencing has many wonderful applications. It can be used beautifully and effectively around your home or business. Besides being an attractive accent, a decorative wrought iron fence can add a great amount of security. Whether next to a golf course, a green belt, or your neighborhood, you can add a distinctive look with decorative wrought iron fencing. 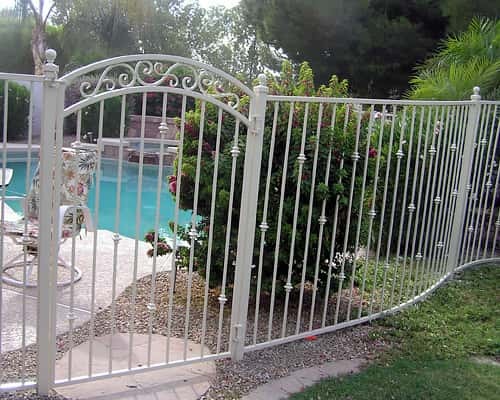 Sun King Fencing & Gates has been providing custom-built wrought iron fencing throughout the Phoenix area since 2002. Are you considering a decorative wrought iron fence for your home or business? We are happy to stop by your location to help design the perfect decorative wrought iron fencing for your home or business. If you have designs already drawn up, we can take your drawings and perfect them to meet your specific decorative wrought iron fencing needs. Sun King Fencing & Gates offers the finest decorative options to enhance the appearance and functionality of your fence. We offer a variety of metal thickness to meet your security needs. 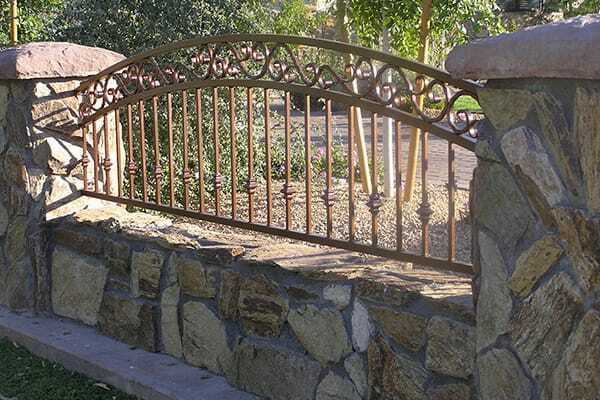 All decorative wrought iron fencing installed by Sun King Fencing & Gates is custom-made at our plant in Mesa, Arizona. The reason that we custom manufacture every decorative wrought iron fence is that no two applications are the same. Plus, when we manufacture your decorative wrought iron fencing, we ensure that it is designed to perfectly fit into the space that you are looking to fence. By having custom-made decorative wrought iron fencing installed, you are provided a fence that looks and fits perfectly. 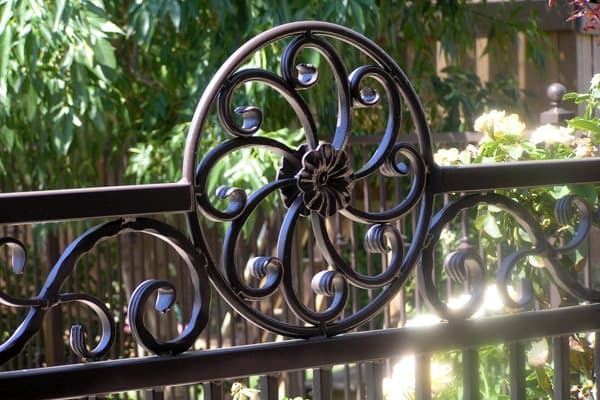 Our manufacturing process for decorative wrought iron fencing at Sun King Fencing & Gates is second to none. Our professional welders use only high-quality bulk steel that is specifically cut to your dimensions. It is then professionally fabricated giving your decorative wrought iron fencing exceptional strength. We then apply an epoxy-based primer with an electrostatic paint gun in our paint booth giving your decorative wrought iron fencing a protective base. Next, an environmentally safe polyurethane paint in the color of your choice is applied. The polyurethane paint wraps the steel with a hard outer shell protecting it from sun and water damage. If you have a design in mind for your decorative wrought iron fencing, we can help make it a reality. At Sun King Fencing & Gates, we are a licensed, bonded and a registered contractor giving you assurance of professionalism and protection. We pride ourselves on providing timely estimates for your decorative wrought iron fencing. Plus, each estimate can be adjusted or modified to meet your specific needs and budget. To find out how we can help you, give us a call at 602-989-0839. You can also reach us with any questions through the provided form. 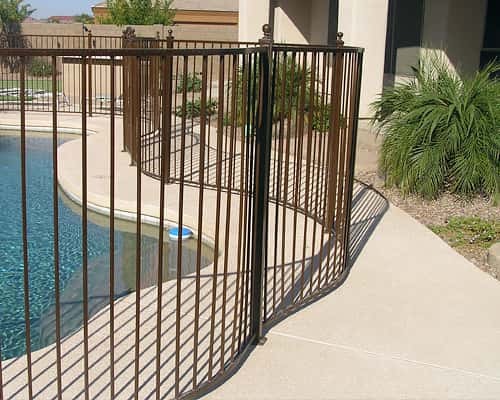 Sun King Fencing & Gates proudly serves the communities of Apache Junction, Cave Creek, Fountain Hills, Gilbert, Chandler, Mesa, Paradise Valley, Phoenix, Queen Creek, San Tan Valley, Scottsdale and Tempe with high-quality wrought iron fencing. From consulting and design to manufacturing and installation, Sun King Fencing & Gates is Phoenix's trusted custom fencing and gate company. We encourage you to explore that variety of products and capabilities we offer to enhance the appearance and security of your home or business.